The quest for interior peace is much more than the search for peace of mind. It really is about something else: opening ourselves up to God’s actions. It is important to understand a simple but spiritually important truth: the more we reach out toward peace, the more the grace of God is capable of acting in our lives. Like a tranquil lake perfectly reflects the sun, so is a peaceful heart receptive to the action and movement of the Spirit. 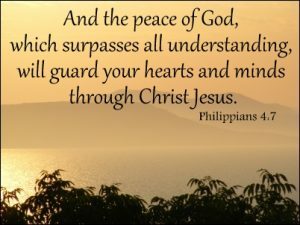 The devil is ever solicitous to banish peace from your mind, knowing well that God only dwells there in peace, and that it is in peace that He works His wonders. Saint Francis de Sales said the same thing to one of his followers in a letter of spiritual direction, urging her to keep a tranquil heart. Only a peaceful heart is capable of truly loving. Remaining calm in the face of trouble, uneasiness, and interior disturbances is necessary in order for God to act in our lives. We can still grow in love, and our lives can have the fruitfulness we are called to have if we can accomplish this inward peace. I would add that the only time we have good discernment is when we are at peace. When we’re preoccupied by worry, disturbed by events in our lives, our emotions can get the best of us and we don’t have an objective grasp on reality-we are tempted to see everything in black and white and question everything in our life. On the other hand, when we are at peace we see life clearly…. We should adopt the following rule of conduct when a problem has robbed us of our peace, the most important thing is not to resolve the problem in the hope of regaining our peace, but to regain a minimum of peacefulness, and then to see what we can do to face the problem.